Naba Disha is a programme of the Kolkata Police that runs in partnership with Vikramshila for children from marginalized communities residing in slums and squatter colonies that are especially crime prone localities. The centres are mostly located within the police station to strengthen linkages between the police and the local community .Vikramshila was the first NGO approached by the police, through CRY (Child Rights and You) to undertake the centre operation in 1999, when the idea of Naba Disha first developed. The then commissioner of Police Mr. D.C. Bajpai was instrumental in initiating this. Vikramshila also has the largest number of centres to look after as of now (13 in the city and 7 in the greater Kolkata areas). 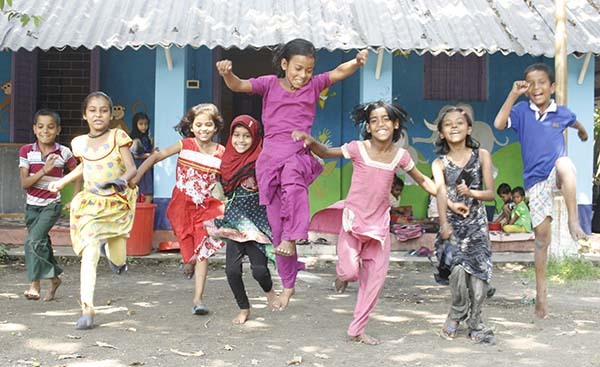 Vikramshila runs the centres for children aged 3 to 18, following a life- span approach to education - “from school readiness to job readiness”. The centres offer a holistic educational programme for children of ages spanning from 3 to 18 years. It offers early childhood education, after-school learning support, activities around the library, citizenship education and employability support. Working for more than a decade, the programme has successfully created an education model that synergizes the will and efforts of the local community, the government institutions, corporate and volunteers to reach out to the most marginalized children; and work with them together, to build a foundation for them to stand on and walk ahead, independent and confident. With a strong commitment to strengthening the existing government system and years of expertise in working with a large group of children from less privileged homes with very little exposure, the year of 2015 witnessed a rigorous intervention in 75 government schools around its education centres for the transference of Vikramshila’s technical knowhow and skills in education pedagogy from its own Naba Disha centers. The objective is to work in specific areas with schools in collaboration with SSA to bring about changes in the educational practices through library management, Early Grade Reading, learning camps and ITE that are visible, measurable and can be implemented in the curriculum. The programme over the last one year has covered an entire spectrum, covering all stakeholders, from children, community, government schools, and district office to education department. The collaboration with the government has provided a huge platform to reach many children as well as teachers leading to a large scale, systematic and permanent change. Vikramshila’s teachers, who have been trained in the organization’s philosophy, as well as have hands on experience in running the supplementary centres for more than 15 years, were selected to work in the government school outreach interventions. They have successfully piloted all the interventions. The ECE program of Naba Disha takes into account the foundational years and ensures an enabling environment for the child’s life-long learning and makes the child school ready. The program is currently reaching out to 361 children. In the Naba Disha centres, learning support is the core support given to children from class 1 to 9. The major work is mainly focused on basic literacy and numeracy, building concepts of math, science and several activities that foster language development. Students are assessed as per the learning standard of NCF 2005. In government school, learning support is provided in the form of remedial camps. A five days remedial camp for Math with a variety of worksheets, resources and TLM was conducted in 32 government schools, for class 3 to 5 based on the school’s requirements. It reached out to about 1000 students. The camps were carried out in Urdu, Bengali and Hindi medium schools. Reaching out to 280+ children in the centres and 1000+ students in government high schools, Naba Disha team continued to empower students’ through technology enabled learning. We made inroads into the government school system in 2016, taking our learnings of ITE into 21 high schools with computer labs to induct their students and teachers into the process of creating student led learning artifacts in the form of projects and presentations. 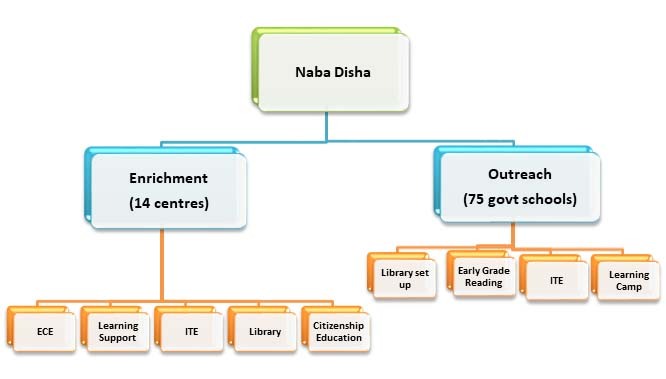 Over 1100 students have accessed the library facility of Naba Disha centres. Library continues to be an active learning centre for language development where children from print deprived families enjoy reading independently. They actively engage in peer reading and learning. Colourful books have transformed the children who were once very passive. The library has opened a whole new world to these children. It has become their personal space where they have an easy access and freedom to read. Where previously schools did not have an active library, there was a lack of sufficient graded books and materials, a separate time table, at the end of the year functional libraries have been set up in 27 government schools. Vibrant library rooms were showcased as model libraries. Out of these 27 schools, 24 schools opted to conduct early grade reading classes for their students. These classes were held for class 2 in the first year, reaching out to about 500 students. A two-day orientation programme at SSA, Kolkata was organised with the government school teachers of 53 schools both primary and upper primary schools in Kolkata district on library as active learning space, early grade reading and Integrated technology in education. A gallery walk was also exhibited for them where we had displayed all the materials for language work made by our Naba Disha teachers, library books graded as per GROWBY put up in a hanging pocket library and the big books created by our Naba Disha children. In one Library class, the school teachers came in the classroom and saw the charts made by the students. They were surprised to see the word walls and other charts prepared, as they had no idea of the capability of the students. We saw an interest from the parent’s side with the library class. There’s also a drastic change in the behavior of the students, previously students who were not at all interested in studying or sitting with a book, those students are coming to the classroom and completing their pending drawing and writing activities. They are also engrossed during storytelling and shared reading activities”,aid Nazneen, one of Vikramshila’s teachers. It was around 2008-9 that Naba Disha’s children, who had grown up from little children to bright young adolescents, seeded the idea of citizenship education in our minds. The students who had been exposed to Vikramshila’s pedagogies involving critical thinking, questioning, going beyond the face value of something, digging deeper for truth – began to use the same sceptical outlook in their everyday life. Somewhere they had begun to think about their homes, lives and communities, the scarcities, the problems and social issues in a new light. It wasn’t just about good or bad anymore; it was about ‘why’ and ‘how’? Why was there a scarcity of resources? Why were there fights and crimes around them? Why were the water and drainage lines improper? Why did local authorities not do something about it? Why was there so much dirt and garbage stacked outside their schools/homes? Why were girls not safe outside home in the evenings? Why did fathers indulge in substance abuse? Why should their mothers get beaten? Who was to blame? Who was to take responsibility? Through workshops on the ‘self’, ‘self and Society’, ‘the self and other’, ‘our homes and communities the world beyond us’- the children were made to realise their own agency, their own abilities and the fact that they themselves can help bring change in small ways, which would gradually create larger changes when the community itself would participate. This led to the creation of civic action groups - 8 groups of adolescents in different Naba Disha centres, who carried on their discussion groups, identified certain social problems in their community and found innovative solutions through various social media that they were capacitated in by Prayasam (a Vikramshila partner agency in 2009-10) – e.g. comics, posters, street play etc. We’re happy to share that these interventions have stayed with the children. Even after Prayasam was not working with the groups on a regular basis, the groups did stay attuned to the social realities around them. They undertook their regular meetings, took down the minutes of the meetings, developed monthly ‘Bal Akhbaars’ that captured the news, events, and articles around their community , school, city, country, even international events. These newspapers helped children keep a keen eye on the changing society around them. In addition, several workshops on local history and livelihoods were also undertaken. For many of their centre level projects around citizenship, the children had to undertake observations, surveys and interviews of officials, school teachers, Head Teachers etc. Some sessions on questionnaire development, interview skills and observation skills were thus undertaken. Today, the Right to Education Act and the National Curriculum Framework envisages a system of education that is holistic and enables the child to take an ownership of their school and surroundings, responsibilities in caring for the environment, develop rational, analytical and critical thinking and work together as a group. We too wish to go further in this kind of enabling education, especially in the light of the rapidly changing world around us, the need to make meaning out of the fast changing social fabric, changing value systems and high level of technological intervention in our lives. We need to empower our children to make informed and sensitive choices in their lives and enable others to do so as well. We wish to see our children educated and empowered. Education, for Vikramshila does not mean academic excellence alone, it implies the creation of an active and sensitive citizen, who espouses the values enshrined in our Constitution – understanding the worth of a democratic, secular, socialist republic. It is heartening to see how the children have grown in their thought process over these last 3-4 years, as is reflective in their selection of issues – moving from immediate local to more macro level issues; understanding the problems that can be solved at their level and which ones need support from local authorities – be it the police, the local municipality or others. How to negotiate in daily life, working together in a group, demanding change and acting towards it through community mobilisation are areas that they need greater capacity building in. As our society grows more and more individualised, the nature of crime changes. The rate of crime grows. In the midst of the turbulent times that our state and nation are facing, we want our children to be empowered in dealing with the crises, appreciate the value of a group, work in quiet cooperation and solidarity to make things better for all. It’s not always about rights, it also about duties. It is important to be a part of the community, nurture and develop it for greater good. Madhu is now a second year student in college studying Commerce. She joined the National Cadet Corps in 2014. She won several medals and certificates last year for best performance in cultural program for poetry. Several old students of Naba Disha are now working in retail stores such as Inox Story, Shopper’s Stop and many more. Where students are unable to explore career options, Naba Disha gives wings to their aspirations by offering career counselling through experts who guide them to choosing a suitable career. This is one of the holistic and longitudinal outcomes of the quality intervention that these supplementary learning centres have been aiming to provide to urban deprived, “at risk” children following a life span approach to education – from schools readiness to job readiness.